Negare was bogged down two lines back, cursing his own foolhardies who charged ahead of the rest. He could only watch helpless as each paid the price. Attacking uphill was a handicap from the start, made worse by the undisciplined. Those few who reached the enemy were cut down, or crushed beneath their own upended steeds. 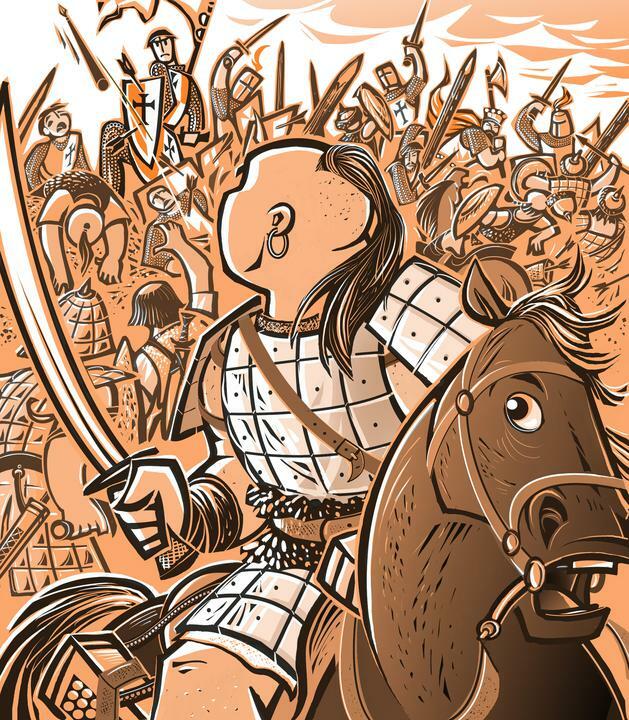 Negare spurred his pony up and down the face of the shield wall shouting encouragement at his troops. “Now! Go forward and kill them! Go! Go!” His troops let out a great war shout, as much to hearten themselves as to alarm the enemy. The hardened warlord saw in the blanched faces of his men, the same anxiety and fear he continued to fend off with each new battle waged. Once blood is shed, however, such sentiments were smothered by the thrill—that overwhelming urgency—to survive. Negare’s ranks had been broken by the panicked horses, and men were falling as arrows found their marks. Still the main body continued to slug their way uphill snaking around or over the casualties to confront anyone looking more vulnerable. Relatively few of the thousands who set out survived the initial charges and reached the shield wall, but those succeeding still outnumbered the knights two to one and assailed the beleaguered combatants vigorously. Often the charge unraveled into a confused series of free-for-alls. Small clusters of men jumping into personal bouts of hew and parry. Others were flung back, only to rally and advance yet again. Such pandemonium galled Negare. His regimented columns had dissolved in utter discord. From all he saw, nothing was being accomplished. Again his cavalry charged, only to fall back. Each foray thinned Negare’s ranks. As the warlord’s resolve stiffened, he vented his frustration in a bloody rage on any hapless soldier crossing his path. Some of them may even have been the enemy.